Last Friday's unprecedented and decisive federal court order directed the Wisconsin Legislature to redraw and pass into law new State Assembly (and State Senate) district boundary maps before November 1, 2017 – because the same three-judge panel stuck down as unconstitutional, the hyper-partisan, secretive and costly 2011 state legislative maps last November. As a result, ending partisan gerrymandering in Wisconsin is now and will be a front and center issue for all Wisconsinites for the remainder of this year and probably next year as well. This issue affects everything else that is done (or not done) in state government, so every citizen has a stake in the outcome of the struggle ahead. The three-court panel chose not to redraw Wisconsin's state legislative district lines, as Democrats had hoped, but that was hardly a surprise. 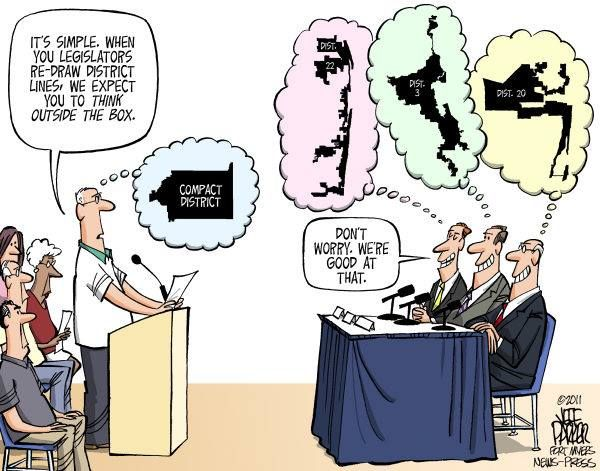 Courts have generally given great deference to the Legislature in redistricting matters. 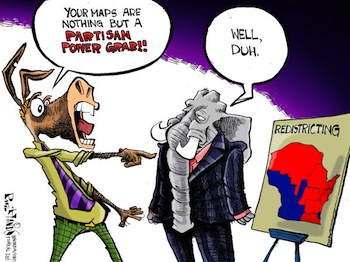 But the unprecedented judgment that the 2011 redistricting process in Wisconsin – reported to be the most hyper-partisan, secretive GOP gerrymander in the nation in 2011 and one of the five most unfair in the history of the United States – was unconstitutional because it was so excessively partisan means that the Court has directed the Legislature to pre-approve the new maps this year, before it can become law. That is a dramatic departure from the past. Citizens can and must play a vital role in the weeks and months ahead. We must contact our legislators and demand that redrawing of the maps this year take place in the public eye, with public participation, input and scrutiny. No more secret meetings in high-priced partisan law offices where taxpayer dollars are used to draw secret, hyper-partisan state legislative voter maps. Secondly, we must demand that the Legislature quickly hold public hearings and then consider and bring to a vote Senate Bill 13 – bipartisan legislation introduced on January 26th in the Legislature by State Senator Dave Hansen (D-Green Bay). This legislation, introduced for the third consecutive legislative session, is modeled after the Iowa redistricting process which was adopted by and enacted into law in 1980 by a Republican Governor (Robert Ray) and a Republican-controlled Iowa State Senate and House. Why? Because the Governor and the Legislature came to the realization that a non-partisan system, in which a professional state agency should draw the maps (carefully following strict, specific criteria) and not partisan legislators, would have the support and confidence of the citizens of Iowa. In Wisconsin currently, public interest and concern is ignored in favor of narrow, selfish, partisan considerations. It is imperative that all of us contact both our State Senator and our State Representative and demand that they co-sponsor and support Senate Bill 13. Thus far, the legislation has the support of 13 State Senators – all Democrats, and 33 State Representatives – including Republican Todd Novak of Dodgeville. We need to pressure Republicans to break rank with their leaders and do the right thing for voters. If you are not sure who your state legislators are, go here. Please share with us any response you may receive. Also, please let us know if you have contacted your State Senator and State Representative and they do not respond. We will make that information public as well (without disclosing your name, of course). We have a genuine opportunity to vastly improve Wisconsin elections in the weeks and months ahead. We must take advantage of it! For more on the court decision and the need to enact Senate Bill 13, please read this excellent article and very recent editorial from the Wisconsin State Journal. To see what CC/WI has been saying recently in the press about this issue go here and here. A federal three-judge panel this morning ordered that Wisconsin state legislative district maps be redrawn by the Legislature before November 1, 2017 – before the 2018 elections. They cannot be redrawn in the same hyper-partisan way that they were in 2011. This is a big victory for transparency, non-partisanship and, most importantly, for the long-suffering voters of Wisconsin. For more on this encouraging development, go here; to read the actual federal court decision, go here. We Need You to Help End Partisan Gerrymandering in Wisconsin! In November, a federal three-judge panel declared Wisconsin's 2011 Republican redistricting process (gerrymander) unconstitutional essentially because of the hyper-partisan, secretive manner in which it effectively disenfranchised hundreds of thousands of Wisconsin voters. The Supreme Court of the U.S. (SCOTUS) could rule on the case this year, but in the meantime, two former Wisconsin State Senate Majority Leaders have argued that the federal court should redraw the state legislative boundaries now, rather than wait for the SCOTUS decision. We agree. The Court should heed the wise words of Dale Schultz, a Republican from Richland Center and Democrat Tim Cullen of Janesville, who also serves on the CC/WI State Governing Board. Read their excellent op-ed on the matter. Even if SCOTUS takes the case and a federal court is ordered to redraw the state legislative district boundaries for 2018, the temporary correction will only be in place through the 2020 election. Then the decennial Census will occur (as it does every ten years), and legislative and congressional districts will be redrawn again in 2021 to reflect the changes in population. The overwhelming majority of Wisconsinites do not want to see partisan politicians – with their self-centered, partisan selfish interests – controlling the redistricting process in 2021 as they did in 2011. Both former Senators Schultz and Cullen, Common Cause in Wisconsin and the entire reform community and virtually every pro-redistricting reform legislator is united behind a proposal that will shortly be introduced in the Wisconsin Legislature by State Senator Dave Hansen (D-Green Bay). The proposal is modeled after the highly-respected, effective non-partisan redistricting process that has been the law in our neighboring state of Iowa since 1980. Senator Hansen's press release on the legislation is here and the legislative proposal itself can be examined here. It is very important that you act now, or within the next several days and demand that both your State Senator and your State Representative co-sponsor and strongly support the "Iowa Model" redistricting reform legislation being introduced very soon by Hansen. Tell them to call Sen. Hansen's office (608-266-5670) and add their name as a co-sponsor of the legislation immediately. Again, contact both your State Senator and your State Representative. If you are not sure who your State Senator and/or your State Representative is go here. Here is another way you can help advance ending partisan gerrymandering in Wisconsin during the new state legislative session. If you have not done so already, please sign our Petition in support of the Iowa Model legislation, which we will present to the Legislature when the legislation has been formally introduced in both the State Senate and Assembly and we begin pressing for a public hearing. If you have already signed the petition, please get members of your family, friends and like-minded citizens to sign it as well. We currently have more than 2,200 signatures and would like to boost that total up considerably, if possible! We can make this much-needed reform happen in Wisconsin if citizens press and force their legislators and the legislative leadership to make it happen. This requires all of us to do our part and make our voices heard!